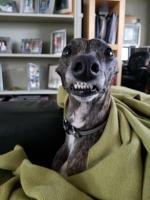 Italian greyhound collars and coats are the essential outfits for the safety and well-being of your iggy. Find the best deals online. A martingale collar tightens gently when the dog pulls back, preventing the sighthound conic head from slipping out when they pull back. Hound collars of this type are made with soft fabric, gentle on the delicate necks of these miniature greyhounds but sturdy enough to keep the dog safe, should he lunge or pull back. They are the smartest and safest option to walk comfortably your small hound. They are fashioned with the flashiest fabric and come in colors to match any taste and dog’s coat. And I must admit Italian Greyhound collars look lovely on the elegant neck of these small hounds. If you order one online, find the exact size by measuring your dog just behind the ears. On this page you can find pictures and more detailed info about finding the right collar size for your hound. To make at home an Italian greyhound martingale collar, click on the link to open a page with detailed instructions. Italian greyhounds lack of body fat and warm protection against cold weather, a winter dog coat is fundamental for your dog’s well-being. E-Bay is an inexhaustible source of inexpensive Italian greyhound supplies. Above are some great winter dog coat especially designed for IGs. Most regular dog coat will not fit the curvaceous body of an Italian greyhound and will slip sideways when he moves. If you are the crafty type click here for a free dog coat pattern to make cheap, custom dog outfits. To adapt the dog coat pattern to your iggy size, measure your dog from the base of the neck to the base of the tail for the length and around the chest, just behind the elbows. If sewing is not your cup of tea on this page you can find simple instructions to make with an old fleece blanket and a pair of scissors a hound coat in minutes, adapting the pattern to your dog’s size. 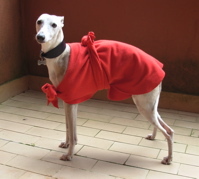 Did you make a coat for your Italian greyhound? Share your pictures on this page, we want to see your masterpiece!